Power supply: my interest in this module grew out of an inquiry as to whether it could be safely run from ±15V split supplies. A quick check of the datasheets of the fitted chips immediately threw up an apparent anomaly: the Analog Devices datasheet for the AD SMP04 Quad S&H chip fitted to the enquirer's module (date code '08) clearly states that the absolute maximum supply voltage is 17V, and yet in the M23 it is being subjected to ±12V, i.e. 24V is applied across the chip. Shortly afterwards I acquired an example for myself: this is fitted with a Precision Monolithics Inc. SMP04 (date coded '91), who I assume originally designed the device. AD acquired PMI in 1990: I've not managed to track down the PMI version of the datasheet, but it is possible that PMI-built devices are happy with a higher-than-17V supply across them: could it be that AD were simply more cautious about the max applied voltage? ; could they have put it on a different process which was less 'durable'? (but would this mean that the '08'-coded AD device is old PMI die stock? 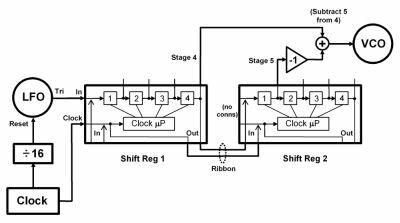 )—lots of questions, with no definitive answers, so the case isn't proven that the 24V is deleterious to the operation/longevity of the device (though I wasn't going to bet the �11 cost of a chip when designing my replica below, which runs it off ±8V supplies!). It does however seem that the increased supply causes the droop to be worse—this is discussed in the next section. which suggests that the 'oversupply' is indeed having an undesirable effect on the droop! 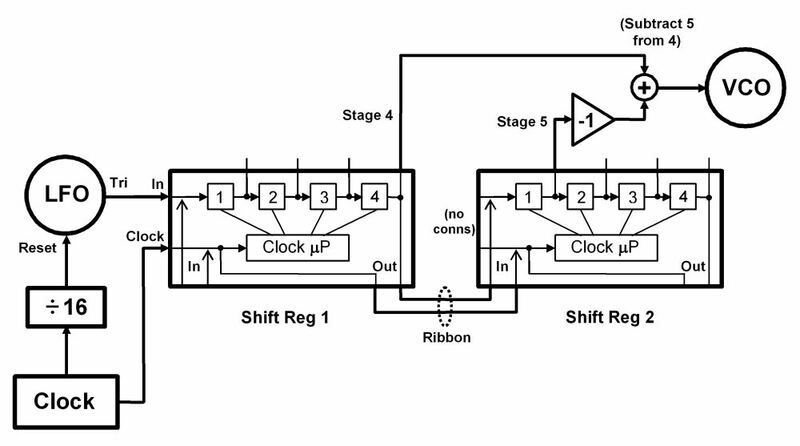 Chaining error: the M23 has a facility to allow two or more units to be chained together, using a small ribbon cable to join them up and pass the shifted voltage and clock signals between them—unfortunately the clock signal passed between chained modules isn't the right one, so that shifting across the eight (or more) stages doesn't work correctly.